Description: Shrub 1–3.5 m high, stems 4-angled. Leaves pinnate, to 45 cm long; leaflets 7–11, oblong-lanceolate, 7.5–15 cm long, crenate, base oblique, apex nearly obtuse; petiole ± cylindrical, channelled above. Flowers in paniculate cymes. 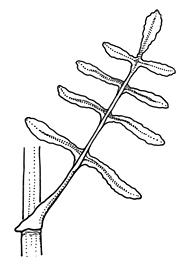 Calyx nearly campanulate, to 25 mm long, lobes shorter than the tube. Corolla tubular to urn-shaped, to 25 mm long, yellow tipped with red. Distribution and occurrence: Native of Madag. One record only, Coffs Harbour district.